All Valentines day worksheets are the same, right? Wrong! 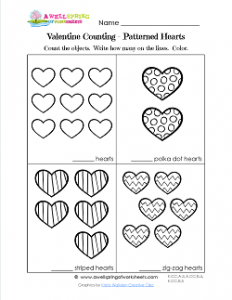 This counting worksheet has four sets of patterned hearts (though one of the sets has no pattern). Kids count the hearts in each set and write how many they counted on the lines provided. The heart patterns are striped, zig-zag and polka dot. Kids can color the hearts in valentine colors or in any color of their choice.